Age-related changes in the eye structure; Windsurfing, skiing, alpinism (vast snow and water surfaces reflect ultraviolet rays almost completely). 250 mg tablets: bilberry extrac – 10.0 mg, ascorbic acid, excipients. 700 mg tablets: bilberry extrac – 105.0 mg, ascorbic acid – 12.5 mg, excipients. Bilberry’s curative properties have been known from the days of yore. Bilberry consumption improves blood supply of the retina, thus accelerating retinal tissue regeneration, improvement of mesopic vision, extending field of vision and reducing eye fatigue. 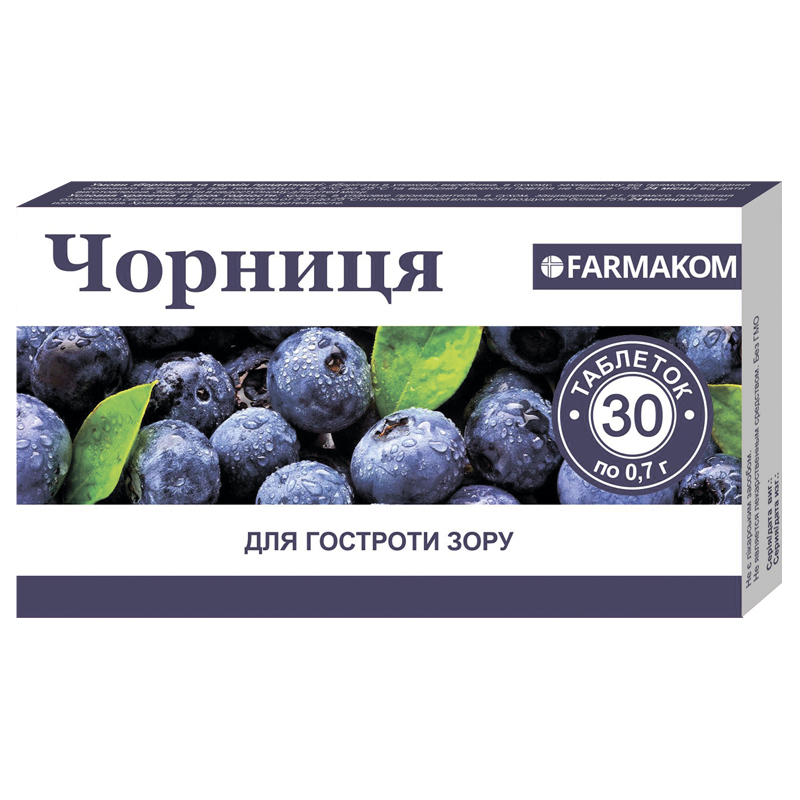 Under the influence of anthocyanins, contained in bilberry, capillary fragility is reduced, vascular walls are strengthened, their elasticity is increased, cell membranes flexibility is increased, inflammation development and clots formation are averted, metabolism in tissues is activated, blood supply of the organ of vision is improved, glaucoma risk is reduced. Ascorbic acid (vitamin C) is an active participant of oxidation-reduction processes regulation in the body, reduces vascular wall permeability, strengthens capillaries in the eyes, promotes sustainment of tone of eye muscles and acuity of vision, has expressed antioxidative properties. 250 mg tablets: Adults take 1-2 tablets thrice a day with a meal. Take with sufficient amount of water. Term of use is up to 1 month, further the term of use and the possibility of retreatment are to be agreed with a doctor. Consult a doctor before use. 700 mg tablets: adults 1 tablet 1 time per day during the meal. Take with sufficient amount of water. Term of use is up to 1 month, further the term of use and the possibility of retreatment are to be agreed with a doctor. Consult a doctor before use. Individual sensitivity to certain components, pregnant and lactating women, children under 12. Proteins – 0.84 g, carbohydrates – 55.05 g, fats – 0.142 g.